Ultra-Orthodox Jewish party Shas has signed an agreement to join the Israeli coalition being put together by Likud party leader Benjamin Netanyahu. 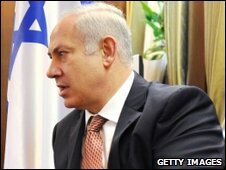 Mr Netanyahu has a deadline of 3 April to build his coalition government. He has already reached a deal with far-right leader Avigdor Lieberman and talks are planned with Labour, headed by Ehud Barak, and other small parties. He plans to build a broad based team, or failing that a coalition of right-wing and Jewish nationalist parties. Talks have so far not proved successful with the largest party in the 10 February election - Kadima - which insists Mr Netanyahu sign up to the two-state formula which has underpinned more than 15 years of Israeli-Palestinian peace efforts. Analysts say a right-wing coalition would be more susceptible to political extortion by small hard-line parties. Last week Mr Netanyahu requested and received approval from President Shimon Peres for a two-week extension to build a national unity coalition. "The creation of such a government is all the more important in view of... the grave [security] threats and economic crisis," the president's office quoted Mr Netanyahu as saying. Mr Netanyahu has said Israel faces "great challenges" including the global economic crisis and what he said was Iran's wish to obtain nuclear weapons. The centrist Kadima narrowly defeated Likud in the election held on 10 February, but Mr Netanyahu has the support of the religious and right-wing parties which make up more than half of Israel's parliament. Shas has been joined many past Israeli governments as a junior coalition member. It has been successful at representing and advancing the the interests of religious Jews of Sephardic extraction. Yaakov Margi MP said Shas - which in the past has opposed negotiations with the Palestinians on certain subjects - would examine every diplomatic issues "on its merits". "We never represented ourselves as being opposed to the peace process," he told Israel Radio. 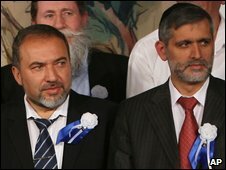 Yisrael Beiteinu was placed third in elections ahead of Labour and is a strong supporter of Israeli settlement activity in the occupied West Bank, seen as illegal under international law and a major obstacle to a peace deal. With his latest deal, Mr Netanyahu now has support of 53 MPs - with 27 Likudniks, 15 from Yisrael Beitenu and 11 from Shas - in the 120-seat parliament. If Labour adds its name to the list that would make a relatively strong formation of 66 deputies. Otherwise, Mr Netanyahu could bring in the 12 members of three far-right Jewish nationalist parties, National Union, United Torah Judaism and Jewish Home.